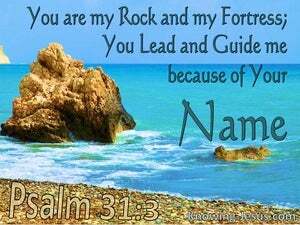 ﻿ Psalm 31:3 For You are my rock and my fortress; For Your name's sake You will lead me and guide me. For thou are my rock and my fortress. Therefore for thy name's sake lead me and guide me. Yes, You are my Rock and my Fortress; therefore for Your name's sake lead me and guide me. For you are my Rock and my strong tower; go in front of me and be my guide, because of your name. For thou my rock and my fortress; and for sake of thy name thou wilt guide me, and thou wilt protect me. 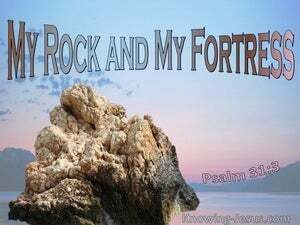 For you [are] my rock and my fortress. So, for the sake of your name, lead me and guide me. For You are my rock and my fortress; and for Your name's sake lead me and guide me. For thou art my stronghold and my castle: be thou also my guide, and lead me for thy name's sake. Because, my mountain crag and my stronghold, thou art, Therefore, for the sake of thine own Name, wilt thou lead me and guide me? 2 Incline Your ear to me, rescue me quickly; Be to me a rock of strength, A stronghold to save me. 3 For You are my rock and my fortress; For Your name's sake You will lead me and guide me. 4 You will pull me out of the net which they have secretly laid for me, For You are my strength. "For the Canaanites and all the inhabitants of the land will hear of it, and they will surround us and cut off our name from the earth. And what will You do for Your great name?" You, in Your great compassion, Did not forsake them in the wilderness; The pillar of cloud did not leave them by day, To guide them on their way, Nor the pillar of fire by night, to light for them the way in which they were to go. "But I had concern for My holy name, which the house of Israel had profaned among the nations where they went.